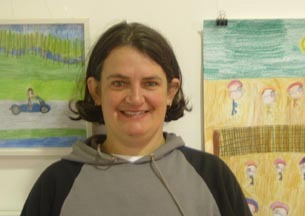 Almrita Langton, a Wellington artist and swimmer, is using her artwork to raise funds so she can represent New Zealand at the 2011 International Special Olympics Games in Athens. Almrita is an artist at Alpha Art Studio, a creative space in Wellington for artists with intellectual disabilities. She started going to the studio 10 years ago, painting for six years and then switching to pencil drawings – a focus of her art over the past four years. Almrita’s task is to raise $5000 for her trip in June. Press Go Productions are helping her find sponsorship money to print her artworks on to cards, wall friezes and calendars. Sponsors will have their company name and logo printed on all packaging and publicity materials. For inspiration and ideas Almrita picks a theme, or draws on her experiences and memories. She likes to draw animals and recognisable landscapes, like Oriental Bay in Wellington. She has held several solo exhibitions, and plans to make some art based on her trip to Greece once she returns to Wellington. As well as being a practising artist and an Olympic swimmer, Almrita also works part-time as an office assistant for SPARC (Sports and Recreation New Zealand). You can request an order form and buy some of the works by contacting Press Go Productions (T: 04 970 7850 M: 027 359 0884 E: ). Original generation time 1.5517 seconds. Cache Loaded in: 0.0005 seconds.